While REITs that own property are generally considered to be low-risk investments, there is a completely different kind of REIT that is anything but safe and predictable. There are two main types of real estate investment trusts: property and mortgage. Although these are labeled as the same kind of investment, they have few similarities, particularly when it comes to risk. Specifically, mortgage REITs pay exceptionally high dividends, but they have a far greater level of risk than REITs that own property. Here's what you need to know before you pursue these double-digit dividends. How do mortgage REITs work? To understand what makes mortgage REITs so much riskier than property REITs, you need to understand the business model that they use to produce those large payouts. The basic idea here is fairly simple. Mortgage REITs make most of their money in pretty much the same way banks do -- by borrowing money cheaply and lending it at higher interest rates. Specifically, mortgage REITs borrow money at lower short-term interest rates and use it to buy mortgage securities that pay significantly more over a long period of time. The "spread" between the two interest rates is the profit, which varies depending on the particular mortgage securities but is typically in the range of 1% to 3%. However, since such a small yield isn't enough to attract investors, these companies use a significant amount of leverage -- in many cases five-to-one or more -- in order to supercharge returns. As long as the spread remains the same, this works out great for investors. Real estate investment trusts pay out at least 90% of their income to shareholders, so a mortgage REIT using seven-to-one leverage at an average spread of 2% should (theoretically) produce a dividend yield of at least 12.6%. Since mortgage REITs rely on short-term borrowing to finance their operations, they are highly susceptible to interest rate fluctuations. And, thanks to the highly leveraged nature of the business, it doesn't take too much of an interest rate spike to erode profits. Consider the example I mentioned above of a mortgage REIT using seven-to-one leverage at an average spread of 2%, so the company earns a 14% annual yield from its investments. 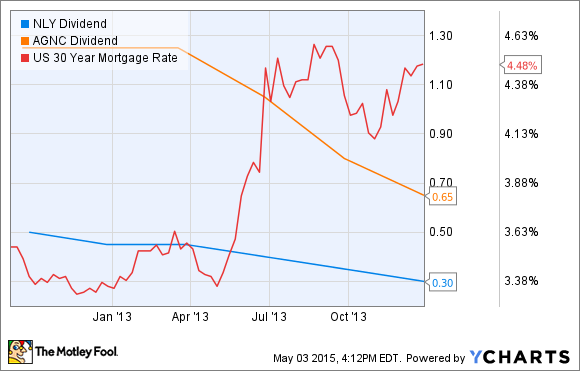 If short-term rates were to quickly rise by just 0.5%, it would trim the spread to 1.5%. This is because while it costs the company more to borrow money, the mortgages it owns still pay the same amount of interest. While a 0.5% reduction in the spread might not sound like too much, when you factor in the leverage, it can reduce the company's income from 14% to 10.5%. Similarly, a 1% spike in rates could cut the REIT's income in half, and a spike of 2% or more could wipe out profits entirely. Of course, this is a simplified example, and mortgage REITs have ways to lessen the blow of rising interest rates. They can use tools such as interest rate swaps to hedge against rising rates, but these only provide some protection. Also, if rates rise gradually instead of rapidly, the REIT can compensate for the higher rates over time by adding new mortgage-backed securities that pay higher rates as older assets mature. Still, a basic rule of thumb is that rising rates are bad for mortgage REITs. This is the primary reason why most of them currently trade for substantial discounts to book value, and why most were forced to cut their dividends last time interest rates spiked in 2013. While mortgage REITs all have an inherently risky business model, not all are the same. Some invest in only agency-guaranteed mortgages (which are safer but pay less), while others are willing to buy nonagency mortgage-backed securities. Some like to specialize in a certain length of mortgage (15- or 30-year), and others like to buy only fixed-rate or adjustable-rate mortgages. Some are willing to take on more leverage in order to produce higher returns. Here is a chart of some popular mortgage REITs, and some details of how each one makes its money. Now, I'm not saying to avoid mortgage REITs altogether -- in fact, they can provide a nice income boost as long as interest rates don't spike. And, in the interest of full disclosure, I actually have a substantial position in one of the mREITs mentioned in the chart above (PennyMac). However, for the reasons discussed here, it's important not to invest too much of your portfolio in assets that have such a high level of interest rate risk, or any other single risk factor for that matter. Diversification is the name of the game, and when used correctly, mortgage REITs could provide a nice income boost to a well-rounded investment portfolio.